As you start doing this, I noticed that after 5 mantras I start to get pressure and a headache. Usually, this just dissipates and is pretty common based on my research on kundallini and Shakti. Using multiple paradigmal energy work, we can easily resolve the headache and pressure. I know a thing or two about energy work. 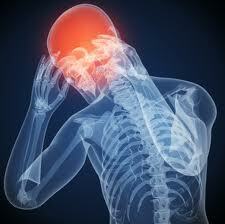 Usually pressure or a headache indicates an energy block. Likewise pain does as well. When you do the mantra to entreat the energy into your spine , really you are asking for a kundalini energy cleansing. Really, you are asking to unravel the holy kundalini serpent. There are lots of ways to do that. The Shakti mantra I have been working with is a more "gentle" way. Still, there are energy blocks. Usually, the whole purpose is to develop enough energy force to blast through those blocks, so your energy and thus your destiny can be completely fulfilled. Alot of times, that results in the blocks acting like damns to the rising energy. The idea is to break through the block, but sometimes the damn is just too strong and the energy gets stuck causing pain. If a person leaves the energy there, it can be quite painful as the energy circles of certain areas just can't handle the less refined energy and it cause damage. If the kundalini pools in the head, and can not flow up paste the crown, headaches result. Temporary headaches are so bad, but the stalled out energy can lead to other problems. Dizzyness, emotional problems, strange thoughts etc. Of course, one way is to just keep pounding the area with more rising energy, however this often creates problems as those very circuits become more and more strained. Many people, if they are just reading a book, and working out of the book, well they just snap and then have to deal with serious problems. Which is why this is a verbal tradition, and why having a Guru is recommended. I know I am pretty clever, and pretty resourceful. Often I can get along just fine without having a teacher. Twice I have been more formally entered into a teaching arrangement. While these situations were primarily in the African Traditional Religion, in both cases people did stuff for money that was horribly unethical. Hindu philosophies also have a large amount of charlatans. A cursory search on the internet for "corrupt guru" will give you all the horror stories you need. Generally, in the west, the Guru seems to only be about the money which is ok... but not always helpful. So you have to be discerning, and careful. That is very difficult if you are working on something. It is often just simply better to DO and not wait till you can find the perfect answer. Usually the DO, will produce some sort of road. So what if you start getting pain or headaches following and working through my blog, trying to do the same mantra work. Following the mantra work, we can do the Microcosmic Orbit , which will loop and spread the energy from the head throughout the body. The energy blocks removed by the mantra work are still gone, and the danger of keeping the Kundalini in the head are removed. The picture below gives you the Microcomic orbit in insane complexity. Notice however, the striking similarities of the back of the person, with the first picture in this block. Kundalini is usually represented by a fire. ( And in the back of of this picture, balls of fire). If you look at the location of the Governing Channel, it is in fact through the spine and is in fact the same channel that is described in the Kundalini process. A diagran that makes it WAY more complicated then it needs to be. Usually, most Gigong teachers will tell you the Microcosmic orbit is relatively an advanced technique because it does not really work if you don't have some energy in the system and it is not just visualization. If you are doing the mantra work above, and get pressure or pain, guess what. That is the body actually responding to energy. AKA you already have the energy in the system, now its just damning up. 1. For the purpose of this exercise, stay in the seated position. The mantric meditation should have already calmed the mind. If not breathe slowly and regulate the breath. Keep your eyes closed lightly. Put your tongue on the roof of your month while maintaining a constant and slow breath. 2. Focus your attention on your Dan Tien (just below your navel, 3 fingers below your navel), and visualize a small ball of energy, a ball of golden or white light, bright and pure. Maintain the attention on the Dan Tien until you feel the energy of the ball. This could be heat, vibration, warmth or just a sensation of its presence. Use as many senses as you can. Your intention will tell the energy to congeal there. 3. This breathing method starts when you inhale through your nose and as if your abdomen would expands, not your chest. Exhale through your slightly opened mouth, keeping your tongue lightly touching your palate just behind your upper front teeth. 4. Inhale and visualize or imagine this small ball of Qi passing down from the Dan Tien, past the Hui Yin ( near the tailbone) up through the coccyx. Then visualize or imagine the Qi ball rising up through the spine to Kidney Point ( Ming-Men) and then to where the ribs meet the spine, then going through this area and right on up to the back of the head, where it joins the neck. Yes this follows the same path as the Kundalini. 5. Use all five of your senses, but focus on feeling, to feel, see and know the Chi ball in the center of your brain, taking in healing energy through the Bai Hui point which loosely corresponds to the crown chrakra on the top of your head. 6. Next, focus your attention on the Yin Tang or 3 Eye point between and just above the eyebrows. This essentially draws the energy down from your head downward. Keep forcing on the the ball of Chi and imagine it goes to the roof of your mouth. 7. Exhale and send the Chi down to your heart From the heart, draw it down through the middle Dan Tien at your solar plexus, past your navel, and down into the lower Dan Tien. Then begin another cycle. 8. As you are doing multiple cycles, try to maintain a constant cycle speed. Imagine the sphere moves around continuously. As you move the sphere around, you will notice your personal energy starts to cycle. After a few of these cycles, you will notice any energy and pressure built up through the mantra process is relieved, safely dispersing the energy and still chipping away at the blocks. There is a tremendous more you can do with this exercise, this is just a start.